Love is the only language everyone understands. Like great works of sculpture made by the Creator, the mountains around his birthplace soar between earth and sky. Joseph Freinademetz grew up amid the magnificent scenery of the Tyrolean Dolomites. His whole life long he remained united with his home country and its people, even when he set off as a young, 27-year-old missionary to China, never to see his home again. Joseph dedicated his entire life to the Chinese. The people of Tyrol made him their very own saint and his parental home in Oies/Pedraces in Val Gadena became a place of pilgrimage. 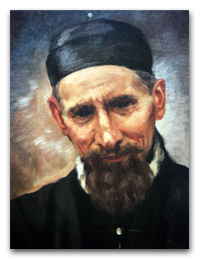 Joseph was born in 1852, ordained priest in Bressanone, Italian Tyrol at the age of 23, and went to Steyl in 1878. The "Society of the Divine Word" was a mere three years old. Just one year later he set out with John Baptist Anzer for China. They were the first two missionaries to be sent out from Steyl. Joseph dedicated the rest of his life to the people of China, where he died aged 56. 29 years in China and the man from Tyrol himself became Chinese. The vast and strange land with its many people became his new home country in spite of everything. The initial foreignness and lack of contact gave way to a deep, inner attachment. In letters he wrote, "I love China and its people and would gladly die a thousand deaths for them. It is here among the Chinese that I wish to be buried and in heaven I want to be Chinese." Labouring under great difficulties and personal privations, together with John Baptist Anzer he built up the mission in the south of Shantung. Neither rejection nor ill treatment deterred him from becoming all things to the Chinese people. Joseph regarded it as his mission to make known to the people the love of their Creator. He was a travelling missionary - administrator of the mission - religious superior. In the words of one of his contemporaries in the mission: "His kindly goodness was of the kind that never ceases and thus conquers hearts, his patience was inexhaustible and his love of neighbour so great that he totally forgot himself..."